Well. Time has passed me by. First things first: CHRISTMAS PICTURES! 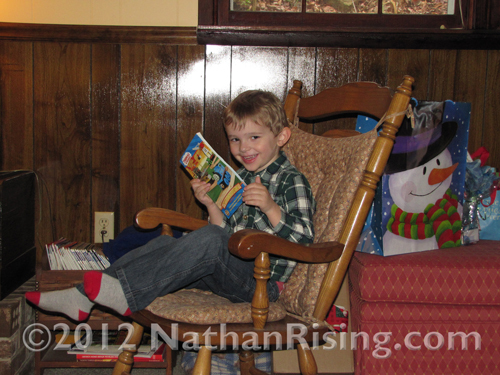 Nathan had a wonderful, wonderful Christmas. We counted down the days and when the Big Day finally arrived, he was super excited. Unlike the previous years, we didn’t have to split Christmas up into two days due to him becoming overstimulated. He handled it quite well! He got everything from Legos to cars to green army men… and even some fruit. Because yes, my kid loves fruit. 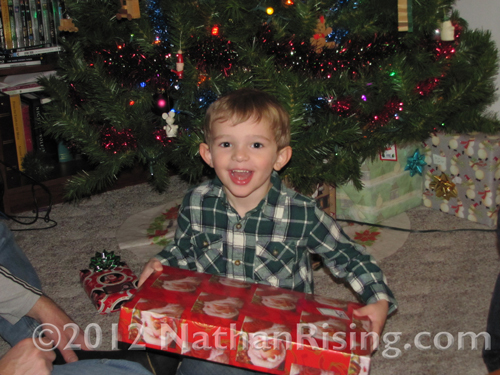 So, even though these pictures are a bit late, here’s Nathan enjoying Christmas. Yay for presents! Mommy and Daddy stayed up LATE the night before making sure everything was wrapped just so. 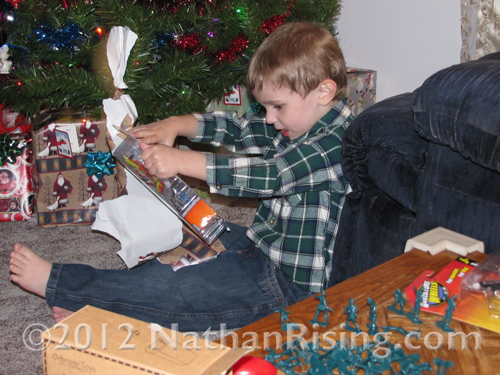 (By the time this picture was taken, he had already unwrapped most of them that were under the tree.) What was really cute, and he did this on previous Christmases as well, was that when he opened one present, he wanted to go ahead and play with it rather than open more. Oh yeah. Some planes. This kid is already causing me anxiety about his teenage years. At the tender age of nearly four, he already loves fast cars, loud music, and fighter jets. 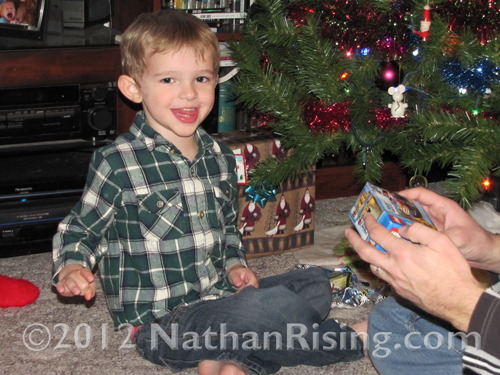 He has a nice range of likes and interests from jigsaw puzzles to dinosaurs to trains to cars… My little guy! My sweet, happy little man. Enjoying a book after all the festivities. And, a really sweet video of him opening one of the presents his Grandma and Grandpa got him… a tunnel for his train tracks! I love how Nathan was so excited that he immediately darted off to his room, where we have some train tracks set up, so he could immediately put his tunnel to use. Gosh I love this kid. He’s my life, my heart, my everything. 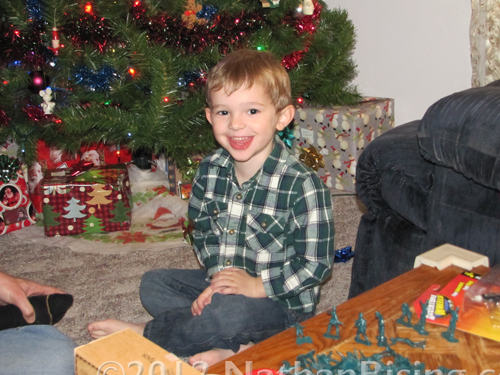 And it’s really hard to believe that this was his last Christmas as an only child… hard to believe he’s going to be a big brother in May! And, we found out just two or three weeks ago that IT’S A BOY!!!! Yes, we are having another little boy, and we couldn’t be more excited!! I can’t believe I’m going to be a mommy to two boys!! !